I came across this bread recipe whilst browsing for a suitable recipe for cinnamon rolls. I knew immediately that this particular bread would taste delicious especially if crispy bacon is used. Suddenly cinnamon rolls seemed to pale in comparison! Although it had a few more steps in the preparation process, it didn't seem too hard to me. The dough was rolled up in a similar style to that of a cinnamon or jelly roll. Luckily my hubby had to work over the weekend, so it meant that I had the whole apartment to myself and definitely time on my hands. I've long learnt that making homemade bread although quite simple can have you being homebound for half a day as you would have to wait for the dough to rise. The end result was really, really good. My hubby thoroughly enjoyed the buns and said that they were the best bread I've made todate. 1) Heat water, milk and butter in sauce pan till butter is melted. Do not bring to a boil. Pour mixture into a mixing bowl and allow to cool to lukewarm. 2) Add honey and 1 1/2 cups of flour, mix till smooth. 3) Add in lightly beaten egg and yeast, mix till smooth. Allow to sit uncovered for 15 min for the yeast to rise. 4) Mix salt and add in 1 cup of flour. Pour the mixture into your mixer. Turn on low spead and using your dough hook, mix the dough. Slowly add in the remaining flour and knead for 5 - 6 mins. 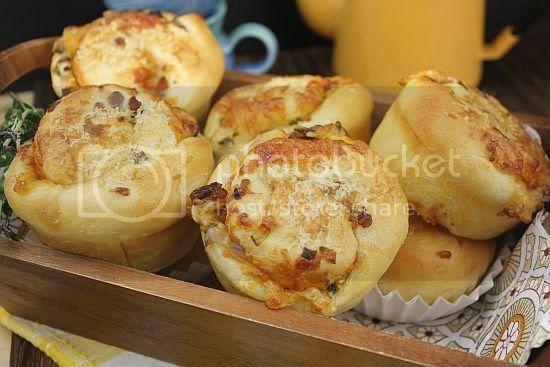 The dough should leave the sides of your bowl easily. If still wet, add a bit more flour. 5) If kneading by hand, pour out onto a floured surface and slowly add remaining flour just till the dough no longer sticks to counter. Knead for 8-10 minutes. 6) Place dough into a lightly oiled bowl. Spray top with an oil spray. Cover with plastic wrap. Set aside in a warm place for 1 hour or till double in bulk. 7) For filling, melt butter in a medium fry pan. Add in garlic, saute for a minute. Add in shallots and cook for about 1 minute. Add the spring onion and cook for another 2 minutes. Finally add in the cooked bacon bits and stir till combined. Set aside to cool. 8) After dough has risen pour out onto a floured surface. Punch down into a small rectangle. Roll out dough into a 12" x 20" rectangle. Pour filling onto dough. Spread with a rubber spatula, leaving about 1/2 inch around edges. 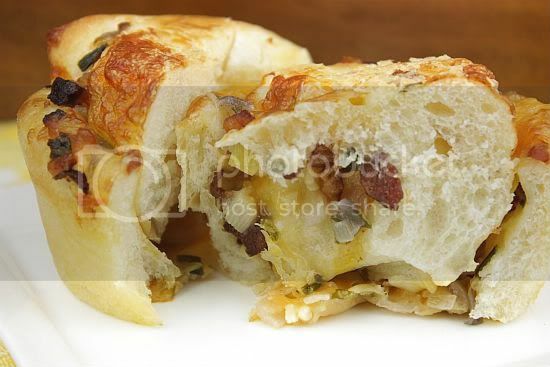 Sprinkle the cheese on top of filling. .
9) Roll dough like a jelly roll. Pinch seam closed with your fingers. Cut the jelly roll into 14 - 16 pieces. Place each piece into a very lightly greased muffin tins. Cover with plastic wrap let rise till double in size, about 1 hour. 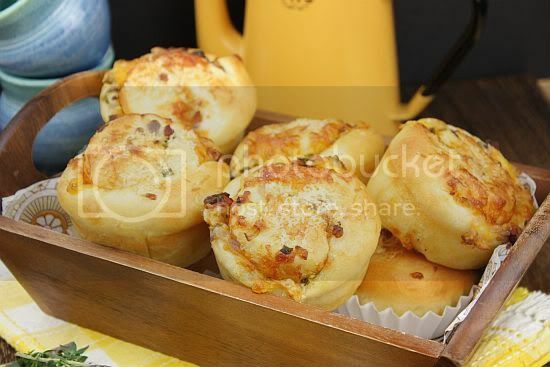 Top risen buns with the grated parmesan cheese. 10) Place buns into a preheated 350 degree oven for 15-18 minutes. Allow to cool 5 minutes before removing from tins. Cool on a wire rack. 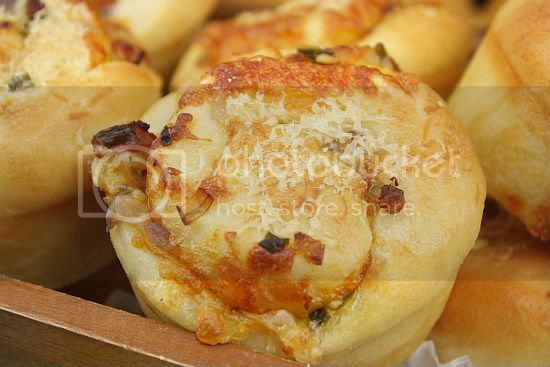 cheese, onios and bacon, they are just perfect in bread..look so tempting. Anything with bacon and cheese! I am so trying this! Wow. I've never seen anything like this. I don't eat bacon but would love to try it with all cheese! These buns look sooo tempting!! Sounds delicious! I almost want to take a bite our of my computer screen! OK, this is the last time I'm posting here today, but I can't help myself. I am in love with these buns. Bookmarked!